Poll: So who should be Arsenal’s front three against Stoke now? So poor old Arsene Wenger has got some selection headaches ahead of him after making seven changes to the Arsenal team that scored five against West Ham at the weekend. Alexis Sanchez started as centre-forward in that game and scored a hat-trick. Last night Lucas Perez was given that position and equalled the feat against Basel, giving him the impressive record of scoring 5 goals after making just 5 starts (and 3 subs appearances). Alex’s display against the Hammers gives him a total of 13 so far from 19 games, and even poor old Olivier Giroud has got 5 from just 2 starts! But he has been a supersub coming off the bench 10 times. Even amongst the wingers we have Theo Walcott on 9 goals (15 starts + 2) and Alex Oxlade-Chamberlain is on 6 (10 starts + 10). And of course Mesut Ozil is undroppable and has 8 goals to his name as well from his Munber 10 position (and is not included in the poll). Poor old Iwobi only got his first goal of the season last night but still has his qualities…. So picking the three starters in the forward line is nowhere near as straightforward as we think it is, so let us see who you lot think should be the starters against Stoke. Maybe we should just pick our best three players? Or even start Giroud and rest the best as we have another game against Everton on the following Tuesday? Pick any three…..
Who should be the Front Three against Stoke City? This entry was posted in Arsenal News, Arsenal NewsNow on December 7, 2016 by Admin. I know that Stoke are traditionally a bogey team, but I’m going for Lucas, Iwobi and Walcott to save the other three for Everton. Lucas must be used while he’s flying! Iwobi, even with his eye for that pass, should only be played when other players are tired/not available. His workrate just frustrates the hell out of me, for such a young player and he makes just as many mistakes with his passes as the OX. Someone pointed out that Sanchez could do what he is doing anywhere on the pitch and I agree. I haven’t seen Perez enough to tell if he harasses the ball when not in possession like Sanchez does but if he does then he has to play because that is a big part of the game now. I would also start Giroud when we predict we will have more possession than who we play. More possession means more corners and more set pieces and you have the best header of the ball on the pitch plus he defends those pieces better than anyone we have except our back 2.
sanchez, ox, Perez for me. Giroud will have a role to play this season but Alexis has been thriving in the CF role. 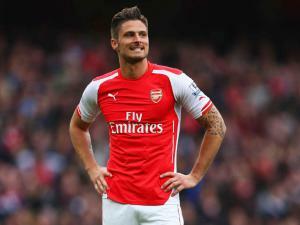 When he plays with Giroud it is noticeable that he is less influential. Our attack is more fluid when we don’t have a targetman, though some games you do want a targetman like Giroud, especially when in some games most of our play is out wide and we are putting in crosses. But Giroud should be no automatic starter. We’ve done that for 4 seasons and it has gotten us nowhere. Lucas is a player who can actually finish and makes the necessary runs, unlike Walcott, and I choose Ox because I hope he can get some confidence back. Iwobi is still young and his time will come, but he’s been just okay since the first month of the season. If Ox found some consistency that could go a long way. We usually deal with Stoke well at Emirates, another story when we go away from home, but I’m rather confident we can pick up three points during the weekend. imo perez should start with iwobi on saturday and then walcott with the ox on tuesday. yesterday’s team give us i think a good indication of the line up for the stoke game,sanchez will play is undropable at the minute and the ox&theo will complete the front 3,do you agree? Giroud will need to play really well when he comes on because he is battling both Alexis and Lucas. Also, Ox, Theo, Lucas, Iwobi are battling each other too. I’ll give Walcott another chance to rediscover his early season form. Just one good game from the OX doesn’t put him ahead of Walcott IMHO. It’ll be Alexis Theo and Ox I’d imagine. We rested a few players like Ox Theo Mustafi Coq Monreal and they will all come back into the side. The bench will look stronger now with Perez and Giroud. Perez may end up with a starting birth but he still has some way to go. Premiership football is much different to European, and we’re playing Stoke, as good as his movement was last night I don’t think he’s quite up to speed yet. He’s only back from injury and still figuring things out. Not a popular thing to say right now I can imagine but Stokes defenders are streets ahead of that Basel rearguard, I’d go with players who already have an understanding of Arsenals game plan/style. Giroud, knocking down balls for Sanchez and Perez on either side.